BREAKING POINT Events following Mike Basham's traumatic experiences with back-to-back Code White failures highlight the need for changes in the way WorkSafeBC investigates incidents and compensates nurses with psychological injuries. He and another psychiatric nurse along with a security guard working at Trail's Kootenay Boundary Regional Hospital are escorting a young psychiatric patient with a history of violence back to a seclusion room after a shower, when suddenly, the patient grabs Basham from behind and begins shoving his pelvis into his backside. The security guard grabs the patient's arm while Basham extricates himself from the hold and immediately hits his panic button to call for a Code White. The team of only three then wrestles with the aggressive patient to bring him back under control. Hitting a panic button should result in help being immediately sent. But on this day the Code White signal is not acted on, and no one comes. Rather than calling the Code White, the reception desk calls the nursing station to confirm that there really is an emergency. Hearing nothing back – because no one is at the station – they assume it is a false alarm and take no action. Meanwhile, the team manages to wrestle the patient back into the seclusion room. They are barely able to keep him contained, but unable to secure him and exit safely. There, they find themselves stuck, and facing down potentially more violence. After an agonizingly long 20 minutes, a housekeeper happens to come onto the unit, hears the commotion, and goes to seek help, which arrives quickly. Now, with enough people on hand, the patient is safely contained with a seclusion room blanket. "Three people isn't an adequate number to get a patient secured," says Basham of the incident. "A Code White team response was needed to do ground containment." The next day, Basham is back on the unit providing care to the same patient, who now appears compliant. As a precaution, however, he decides to call a standby Code White and assembles a full team, in order to ensure the safety of patient and staff before entering the seclusion room to get the patient's vitals and provide oral medications. Just as they set to work, the patient leaps up, grabs one of them and, as Basham describes it, "a dog's breakfast of a wrestling match breaks out." The team quickly realizes they are not capable of securing the patient in order to exit the seclusion room safely. This time the signal for an overhead Code White is sent via the security guard's radio. But for a second time no Code White is called and the team again finds itself pinned down containing the aggressive patient. Eventually, Basham's co-nurse, who has been guarding the door to prevent exit, leaves to find the missing help. Finally, the overhead Code White is called and help arrives. "At every turn, I felt like I was alone." The good news, says Basham, is that no one was physically harmed to the point of needing medical attention. The bad news is that a fail-safe procedure that staff depend on for their security actually failed twice in a row. Worse yet, the violent events would prove psychologically damaging to Basham, who would soon find himself unwell and without support from either his employer or WorkSafeBC. As it happened, Basham returned to work a day after the second incident to instruct a class in safety and violence prevention, a role he has played from early in his career. But on this day something had changed. "I realized that when I was teaching the course the events of the previous two days had actually had quite a strong impact on me," he says. "I ended up calling in sick, as I was unable to work for my next night shift." Basham says he took time off after the incidents to begin therapy. His family doctor said that, given the state he was in, he probably shouldn't go back to work before the New Year. "Working in acute psych has resulted in me needing therapy just so I can go to work," he says. "So I took it upon myself to care for myself and get the help I needed." When someone suffers psychological injury that's the result of exposure to excessive stress, early intervention is vital for restoring the balance needed to return to work. But Basham, like so many other nurses, was left to fend for himself after the incidents, without support from the agency whose job it is to ensure he is kept whole. Psychological injury is frequently interpreted by WorkSafeBC as nothing more than the result of the "normal pressures and tensions of the job of nursing." This language has been used when denying claims for time off work due to psychological injuries, as if the normalcy of excessive stress in nursing somehow means the resulting mental disorders aren't worthy of care. "The traumatic event for me was being in a dangerous situation with the patient, calling for help, and having two of our main safety protocols fail in two days – that was the trauma for me." As it turns out, those events weren't traumatic enough for WorkSafeBC. "I was told my traumatic injuries did not meet the threshold for a claim, which was shocking to me," Basham recalls. Basham's experience also highlights the ways that employer policies and WorkSafeBC reporting procedures are not designed to accommodate the circumstances surrounding psychological injury. He reckons the process of reporting the violent incidents was almost as traumatic as the events themselves. "The whole reporting process is broken," he argues. "Experiencing the incidents, then calling the workplace health call centre, having to re-live it and be re-traumatized by it, then being directed to WorkSafe and retelling it to them and being re-traumatized again, then going to my GP and re-living it yet again – it was re-traumatizing again and again and again." The lack of employer support also did little to promote any recovery process. "We did a debrief with some of the people involved and I wrote a report that I gave to my manager explaining what had happened, but it wasn't a conversation," says Basham. "I think these kinds of psychological traumas, being quite different from a physical injury, the reporting system isn't sensitive to that." Basham also began to believe that looking out for himself and getting the treatment he needed was actually working against his claim. WorkSafeBC took two months to have Basham assessed by a registered psychologist. By then he had completed enough therapy to keep his anxiety under control, and was beginning to think about his return to work. For a claim to be accepted, a worker must be formally diagnosed with a mental disorder and be able to prove the condition was triggered by exceptional stress at work. But the fact that Basham was on the mend two months after his two events enabled WorkSafeBC's psychologist to declare that he had "an adjustment disorder anxiety that was in remission." "I felt like I was alone at every turn in the process and they were putting a brick wall in front of me," says Basham. "It honestly felt like they were trying to string me along as long as possible until I financially couldn't take it and was forced back to work." He describes his entire experience as a bureaucratic nightmare. "I was calling and it seemed every time I spoke to somebody different," he says. "But usually I wasn't able to speak to anybody, so would end up leaving a message and waiting sometimes for a week or longer for someone to call back." In the end, WorkSafeBC denied Basham's claim, just as it has for the majority of similar mental disorder claims made by nurses in the province. His claim is now under appeal by BCNU. In the meantime, he has been left footing the bills for time off work and for the hours of therapy taken after his benefits were cut off. BCNU President Christine Sorensen says Basham's experience is sadly typical of how nurses with mental disorders are often treated by the board. She says many nurses in need of help discover that WorkSafeBC is essentially positioned as their adversary, and feel like the deck is stacked against them when making a claim. "They're not focused on ensuring you get proper counselling after a violent incident, or whether the employer was negligent by not ensuring safety protocols were fully in place. They just want to avoid paying for your time off work and your therapeutic expenses, nothing more." Sorensen says the playing field isn't level when it comes to psychological injury – especially for those dealing with the aftermath of violence at work. "Not only is psychological injury not treated promptly in the way physical injury is, it's actually contested by WorkSafeBC. They assume that because exposure to trauma goes with care provision, the effects of sustained exposure are not a real illness. "So where does that leave the nurse?" Sorensen asks. "Essentially without insurance, and that's outrageous." She says the current approach to psychological injury makes a mockery of the historic compromise behind the workers' compensation process in Canada where, in return for giving up the right to sue employers for negligence and injury, workers gain access to care and benefits under an employer-funded insurance plan. BCNU Acting Vice President Adriane Gear argues that the current situation is the result of a double standard that WorkSafeBC is applying when it comes to dealing with psychological injury claims. "It asks whether traumatic exposures are excessive in intensity and duration relative to the normal pressures and tensions of a nurse's job, not whether you are injured because of them," she explains. "In our view, those questions are irrelevant because any traumatic event can trigger disorders. What matters is the actual state of mind of the nurse, and getting people proper care so they can mend and return to nursing," she argues. "Why is compensation for lost time and counselling denied simply because the events that triggered it are not uncommon in our line of work?" Gear also believes the bar is set far too high at present for nurses to get the help and supports they need for mental disorders. "If you get physically injured at work, you get care and support. Why is it different when the injury is psychological?" she asks. "The playing field isn't level when it comes to psychological injury." There is no question that nurses routinely carry significant stress loads due to their exposure to suffering and trauma at work, including violence. This stress load, combined with systemic understaffing, leads to burnout, compassion fatigue and other mental disorders including but not limited to post-traumatic stress disorder (PTSD). In 2016 nurses accounted for nearly 12 percent of all mental disorder and PTSD claims with WorkSafeBC. A 2015 University of British Columbia study on BC nurses' workloads put a representative sample of all nurses through a PTSD screening tool and found that over 35 percent of acute-care nurses should qualify for further evaluation of their symptoms. Similar results were obtained for community and residential-care nurses. It's evidence like this, along with stories like Basham's, that BCNU is using to take the provincial government to task for failing to include nurses in new legislation which presumes an emergency worker's mental disorder is work-related. Victoria passed the legislation in May, which is similar to laws already on the books in Manitoba, Saskatchewan, Ontario and Nova Scotia, but those provinces' presumptive legislation includes nurses. "The BC legislation discriminates against those nurses who are psychologically impacted from providing care in traumatic situations," says Sorensen. "We are urging Labour Minister Harry Bains to amend this legislation to include nurses in the interests of fairness and to ensure that they also receive timely support and treatment." In the meantime, stories like Basham's – from the ineffective Code White response, to the lack of support during WorkSafeBC's long, adversarial claims process – remain all too common. "The fact that a Code White failed two days running and was not effectively addressed by the employer in a timely manner is totally unacceptable," says Sorensen. She notes ongoing problems at KBRH around the lack of effective and timely responses to serious incidents, which have led to the issuing of WorkSafeBC orders requiring the employer to comply with occupational safety regulations. "Imagine how it affects nurses knowing they can't rely on the emergency security of a Code White to deal with a violent incident." HAVE YOU TOLD YOUR STORY ABOUT VIOLENCE? 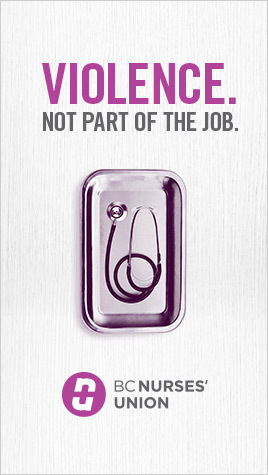 Every nurse deserves a workplace free from violence and psychological trauma while caring for patients. If you’ve experienced a violent incident, witnessed one, or been involved in a near-miss situation that had potential for serious harm, we want to hear from you. We are soliciting stories as part of the union’s inquiry into violence in health care. Nurses across BC now have an opportunity to share their experiences of violent-related incidents via the BCNU website. As part of the broader violence prevention campaign, the purpose of the inquiry is to gather as much information as possible to help BCNU negotiate better workplace protections for all nurses into the next collective agreement, which will create a safer workplace for all. All personal information will be kept confidential, but stories will be used to strengthen the union’s case for change at the bargaining table. Help BCNU and support members by sharing your story using the online form on the BCNU website. Contact your regional chair for more information.